Speed and balance are the secret with this front-wheel drive, lean-to-steer beast. Fat rear inner tube tires and a BMX-taste front wheel assembly permit riders to carve up the curves as though they were on rails. 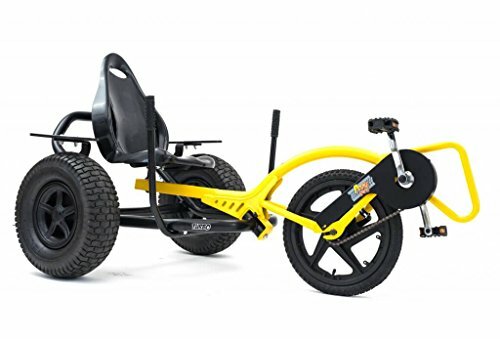 The Turbo’s bright yellow powder coat finish and difficult steel frame mean this three-wheeled pedal Kart is built to last. The wide rear tires add stability, permitting riders to take on numerous surfaces from track to path. A favourite among riders aged 9 and older, the Turbo turns heads as fast because it carves up the corners. Rental use customers love the Turbo for its tricky frame and straightforwardness of repairs. Like any of our heavy-duty Karts, we build the Turbo chassis with CNC bending machines, automatically weld the frames, and outfit the pedal-powered drive with heavy-duty chains. Rider weight restrict: 250 lbs.